Get beautiful, easy to style hair with Shiny Leaf Cold Pressed Castor Oil Conditioner. It has a rich and creamy formula that coats your hair strands to keep them moisturized, soft, and smooth. Improve your daily hair care regimen with the help of this incredible conditioner. The conditioner is filled with hair rescue ingredients that can help maintain hair’s volume and shine. It provides tons of moisture to your hair without weighing it down. The added moisture keeps hair from looking dull and dry. Rich in Ricinoleic acid, this hair moisturizing conditioner keeps hair smooth and manageable, so you don’t have to wrestle with tangles and frizz. It nourishes hair and promotes healthy hair growth. Need help with hair fall and breakage? Shiny Leaf Castor Oil Conditioner is made with hair detoxifying ingredients that help fight these hair issues. It improves hair regrowth by stimulating the hair follicles. Use it every day to get shiny, long, and beautiful tresses. The castor oil in Shiny Leaf Castor Oil Conditioner is cold pressed, not roasted. This process ensures that all the hair-nourishing ingredients are preserved. Roasting the seeds before extracting the oil can remove the important nutrients that often get lost because of the high heat. Having cold pressed oil in your conditioner means you get the full benefits of this amazing oil. For best results, use with Shiny Leaf Cold Pressed Castor Oil Shampoo. 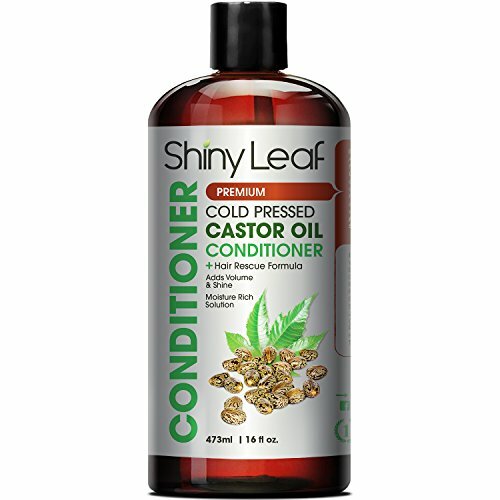 BEST CASTOR OIL CONDITIONER - The best Cold Pressed Castor Oil from Shiny Leaf is now in our conditioner. Our hair regrowth Conditioner is rich in castor oil's hair caring ingredients that give your hair added shine and volume. FOR HAIR REGROWTH - Castor Oil is well known for longer and thicker hair growth. This Conditioner is full of rich ingredients that help with healthy hair regrowth. EASY TO STYLE HAIR - When you have soft and manageable hair, it follows your every move and you can style it anyway you want. No more struggles with tangles and frizz when you add this fuss-free conditioner in your hair care regimen. MOISTURE RICH SOLUTION - The conditioner is full of hair moisturizing components that make your hair soft and shiny. The lush formula keeps your hair velvety smooth all day. BEST SHAMPOO BUDDY - After every shampoo, use Shiny Leaf Castor Oil Conditioner to boost hair's natural radiance. This creamy and easy to apply conditioner won't weigh your hair down. If you have any questions about this product by Shiny Leaf, contact us by completing and submitting the form below. If you are looking for a specif part number, please include it with your message. 100% Medicinal Plants Based Hair Regrowth Treatment for Her - Step 1 Detox, Step 2 Hair And Scalp Stimulating, 3 Deep Scalp & Follicle Treatment | HairWise only Hand Made Products.